What’s the best way to keep in touch with your customers? It’s often hard to know with so many options on offer. From emails to social posts, there have never been so many ways to communicate. But do any of these new channels work as effectively as a piece of emotive mail? 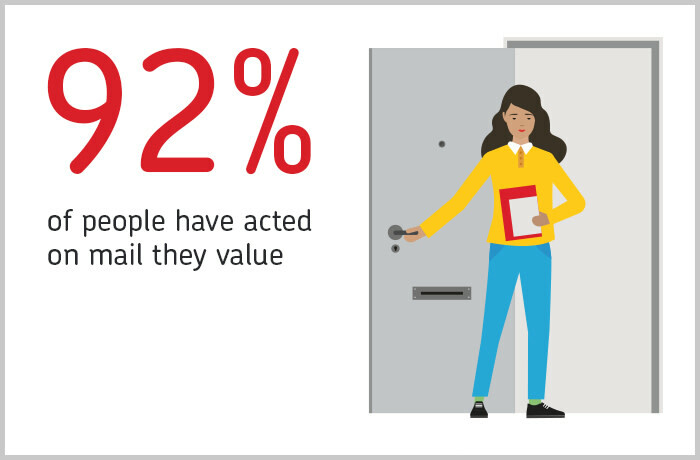 Well, the fact is that 92% of people have acted on mail they value1, while 57% of people claim that mail makes them feel more valued (compared with just 17% for email2). So, it seems if you want action, mail can truly help you stand out from the competition. And, because you know it will be delivered directly to your customers (and kept for days or even weeks) 3, mail can help keep your brand at the front of people’s minds. Over 60% of people say valued mail can help keep a brand top of mind4. It’s convenient too. If you have a franking machine, you already have a fast, self-service mailing solution in your office, whether you’re sending a simple reminder or an important document that needs full tracking. Your franking machine also gives you access to a range of UK and International Royal Mail products — from 1st and 2nd Class, right through to Royal Mail Special Delivery Guaranteed. Why not use it to send thank you messages after a transaction has been successfully completed? Or to broaden your customer base by using your franking machine to pay for postage on your DM campaigns? On average, 23% of mail is shared within a household5, meaning you could be driving more brand awareness than you think. So, when it comes to communicating with your customers, the message is clear: if it matters, mail it.